Sri Lanka's new-look bowling attack ran through the Indian top order, but Sachin Tendulkar scored his 48th Test century to guide India's fight back in the second Test. 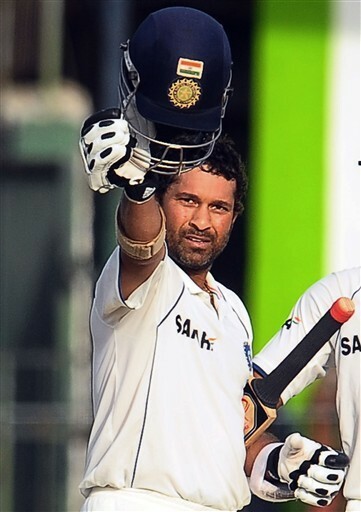 Sachin Tendulkar was triumphant on 108 as India, replying to Sri Lanka's 642-4 declared, recovered to 382-4 by stumps on the third day. After India lost the opening Test in Galle by 10 wickets in the three-match series, and now India need 61 runs more to avoid the embarrassment of a second successive follow-on. Tendulkar stood rock-solid at one end for four hours and 37 minutes to anchor India's revival, Master had put on 68 for the fourth wicket with VVS Laxman (29) and 141 for the unbroken fifth with debutant Suresh Raina(66*). Master rocks. No doubt :) love ya sach. Congratulations on passing 169 Test Matches. Hope u will complete 200 and even more.......My regards to you Sir. punter catch sachin if u can!!! sachin you are a really god of cricket.